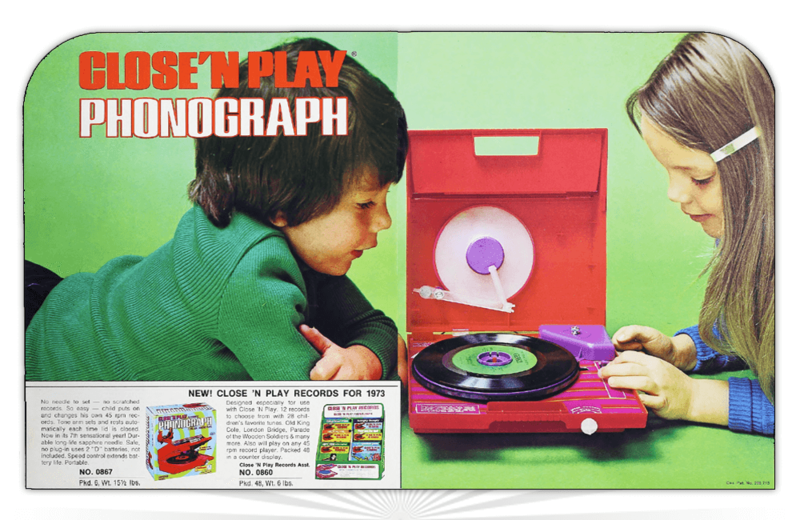 A dealer ad from 1973 for the Close ‘n Play Phonograph from Kenner. First introduced in 1966, the portable record player ran on batteries and played 45 RPM records. As the name suggests, children would load up a record and close the lid to hear audio emitted from the toy’s built-in speaker. The tonearm automatically set and reset itself each time the lid was closed, eliminating the need for little hands to touch the long-life sapphire needle. In 1973, Kenner introduced 12 new records for the Close ‘n Play, complete with 28 classic kids songs, including Old King Cole and London Bridge.